From holographic and heart-embellished to chic, understated ombré, this year is already rife with inventive new nail-art trends… and we’re only a week into February. But for all the Valentine’s Day-ready designs and negative-space French tips out there, there’s one other bold look in particular we’ve got our eyes on right now — and it’s very 1969-meets-1999-meets-2019. Tie-dye designs might conjure up images of Janis Joplin in a technicolor dress at Woodstock, or maybe the fluorescent tees we all wore to play mandatory sports in middle school. Translate that pattern to nails, however, and it stops feeling decade-specific and starts looking decidedly modern. The actual process requires a little more finesse than vats of dye and rubber bands: Artists are recreating the effect by carefully painting nail polish onto the nail in individual swirls, then pulling a striping brush through the center before the polish dries to create the spiral effect. Tie-dye has always been about that imperfect homespun finish — but if you can’t quite nail it, there’s no shame in bringing along the inspiration photos ahead next time you head to the salon. It’s all groovy, baby. South Korean nail-artist trailblazer Park Eunkyung of Unistella is one Instagram-favorite manicurist spearheading the trend. Eunkyung ditched pastels and metallics for neon shades in pink, yellow, green and blue, fashioned into a psychedelic swirl and printed onto classic almond-shaped nails. For an elegant, deconstructed take on tie-dye, consider incorporating a stripe on otherwise neutral nails. Coffin nails aren’t going anywhere fast, according to Instagram nail artist Hannah Schewel, who combined tie-dye with a calligraphy font, a trend that London manicurist Ami Streets already predicted will be huge this year. If you aren’t feeling a whole nail, California-based nail artist Julie Ventura makes a case for the negative space vibe, with a single tie-dye strip down the center. 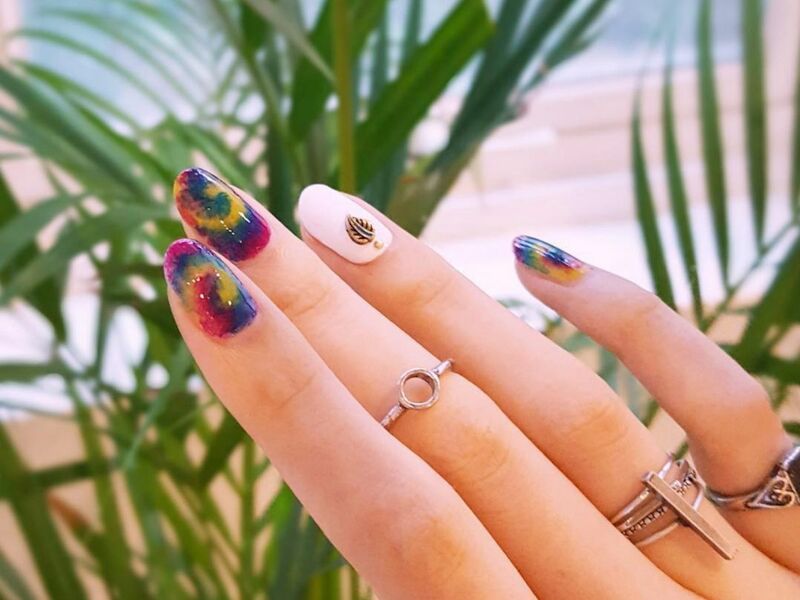 The tie-dye effect looks just as good on short, natural nails as it does on longer acrylics. A matte top coat creates a dry, dusty finish that pairs perfectly with a sunset-inspired color scheme.